Running water piped into our homes is something we take for granted today, but it’s something that Pekin residents have only been able to enjoy for 128 years. The construction of Pekin’s water works was one of the major community improvement projects of the 1880s, the same decade that saw the founding of Mineral Springs Park and the building of Pekin’s original plank bridge over the Illinois River. The decision to install a public water works system was made in the administration of Mayor J. L. Smith, and the system was completed under Mayor A. R. Warren. “The Water Works system in the City of Pekin was completed early in the year 1887, under a franchise granted in May of the previous year, to Charles A. Lamb and Henry S. Raymond. “The system, as originally projected, called for 8 ½ miles of cast-iron mains and 100 fire-hydrants. Since then the street mains have been added to from year to year and, in 1904, the Company controlled 16 miles of cast-iron mains from four to sixteen inches in diameter, with 159 fire hydrants and 12 miles of galvanized iron street-mains of from one to two inches in diameter. “The pumping machinery consists of two compound-duplex pumps, of the George F. Blake pattern, with a daily capacity of three million gallons. The pumps take water from a system of driven wells sunk to a depth of 127 feet, which furnish a bountiful supply of clear and pure water at all times. The water is raised to a stand-pipe 137 feet high, having a capacity of 127,000 gallons, which furnishes a domestic pressure of sixty pounds. In case of fire, pumping is direct into the mains, when a fire pressure of 120 pounds is maintained. The Water Works pumps and water tower were located at the southwest corner of Capitol and Court streets, where the water company is still located today. 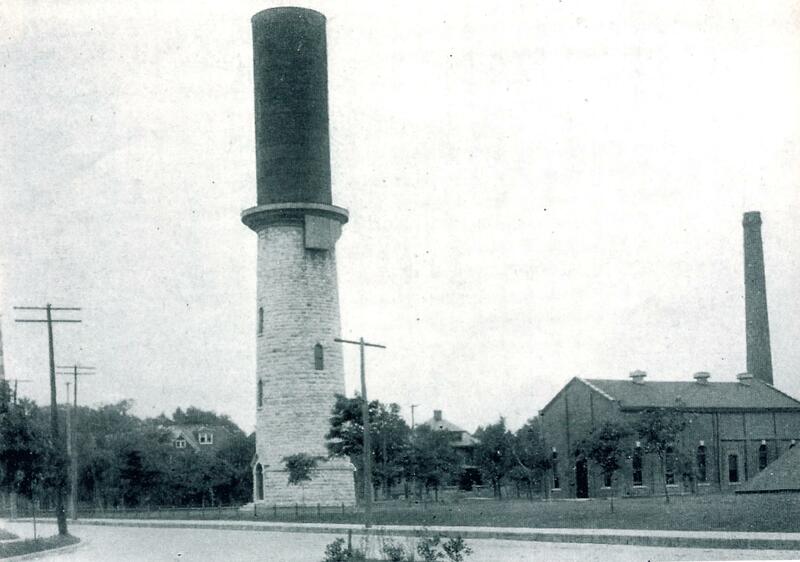 This photograph from 1912 shows Pekin’s old water tower and water works located at the southwest corner of Broadway and South Capitol. This is a reprint of a “From the Local History Room” column that first appeared in October 2013 before the launch of this weblog. Among the most prominent industries in Pekin’s past were coal mining and brick manufacturing, and one company had a hand in both: the Jansen & Company. Jansen & Zoeller was located on Pekin’s East Bluff by Reservoir Road, the area where Sunset Hills is located today. “Millions of bricks used for building many of Pekin’s early businesses and residences were supplied from that location, which was chosen because of the type of clay found in the area,” according to “Pekin: A Pictorial History,” pp. 96-97. The senior partner in the company was John D. Jansen, who emigrated from Germany to Peoria when he was only 22. It was in Peoria where Jansen learned brick masonry. After a time, he moved to Pekin, where he partnered in a brick-making company with Thomas Snyder. Soon after that, in 1894, he joined with Henry Jost and Charles Zoeller to form the Jansen, Jost & Zoeller Company. Jost later left the partnership, but Jansen and Zoeller continued the business, which incorporated in 1899 and was located at 212 N. Capitol St. In addition to brick-making, the firm’s owners also were involved in brick paving of streets. They also were building contractors, and among their projects were Pekin’s old Carnegie Library, St. John’s Lutheran Church and the old Peoria & Pekin Terminal railroad bridge that crossed the Illinois River. According to “Pekin: A Pictorial History,” “In 1891 Jansen’s son, Dietrich, the Pekin City engineer, was admitted as a partner. Dietrich Jansen later partnered with Fred Schaefer to organize one of the most prominent road-paving companies in the state” ¬— the business known as the Jansen & Zoeller Brick Company. 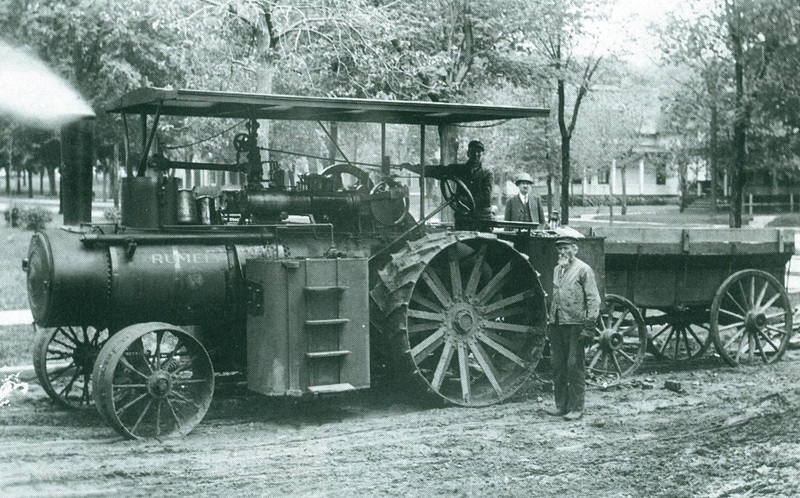 Shown is some Jansen & Schaefer road paving equipment from about 1920. In 1946 Jansen & Schaefer built a ready-mix concrete plant on Broadway at 15th Street, which is today the location of Kroger and a strip mall. Jansen & Schaefer also built the very first paved load road — a work path that stretched from the Ubben Coal Mine on the East Bluff to what is today Court Street. Horse-drawn wagons would carry coal from the mine to the Big Four sidetrack, where a crew would shovel the coal into the waiting train cars. Schaefer shifted to coal mining in May 1939, when he bought one of the old Grant coal mines. It was one year after the dismantling of the Ubben Mine’s tipple structure. The Ubben Mine formerly had been one of the largest businesses in the area, generating more than a million tons of coal from the time it was first opened in 1880 until it closed in 1930. Schaefer’s coal company was known as the Schaefer’s Mining Company or the Pekin Mining Company, and the mine’s entrance was located just off Broadway Road, where the Herget Bank Parkway-Broadway branch was located for many years. Schaefer’s was the last mine in Pekin, closing around 1951. After the death of Fred Schaefer, his daughter Anna and son-in-law Harold McNally, with Jansen’s sons Norman and James, inherited the business. Soon after, an inspection of the mine determined it to be unsafe. So ended the days of coal mining in Pekin. History of 126 Sabella St. This is a reprint of a “From the Local History Room” column that first appeared in April 2013 before the launch of this weblog. Above is shown the rear of the former Vogels grocery store that was located at the corner of Second and Sabella streets. 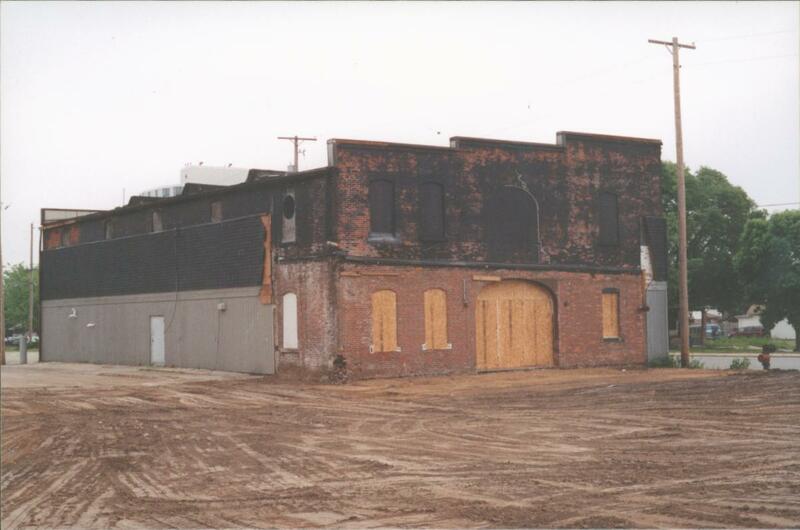 The structure, demolished about a decade ago, was apparently built around 1880 by George W. Rankin, who operated a mill work business out of it. Tags: 405 Court St., CenTel, Central Telephone Company, Citizens Telephone, Idylhour Theatre, Middle States Telephone Company of Illinois, Pekin history ( 87 ), preblog columns ( 58 ), Times Publishing Co., Tribune Printing Co. This is a reprint of a “From the Local History Room” column that first appeared in Sept. 2014 before the launch of this weblog. Just over the past few decades, the telecommunications industry has seen great changes both in technology and in options available to consumers — and over the past century or so, those changes have been vast. “The year 1901 found Pekin with two competing telephone companies: Central Union Telephone Company, first on the scene, and the newly organized Citizens Telephone Company, headed by James W. Barrett. The Citizens Company also established an exchange at East Peoria, adding to their already existing stations at Havana, Manito, Green Valley, Delavan, and Lacon, connected by a system of company-owned toll lines. During those years, Citizens Telephone operated out of a building at 405 Court St. in downtown Pekin -— the same building where the Pekin Daily Times offices were then located, and which suffered a wall collapse over four years ago. The 1887 Pekin City Directory lists the Times Publishing Co., “publishers of the Daily and Weekly Times,” at 507 Court St., but the 1893 directory shows that the Times had moved to 405 Court St. by that year. However, the 1903-1904 Pekin City Directory, page 183, shows the following occupants of 405 Court St.: Times Publishing Co.; Citizens Telephone Co., 2nd floor; and J. K. Hawkins. The Times moved out of the building around 1905, and the former Times offices became the offices of the Tribune Printing Co., a Pekin newspaper that was also owned by the Times Publishing Co. 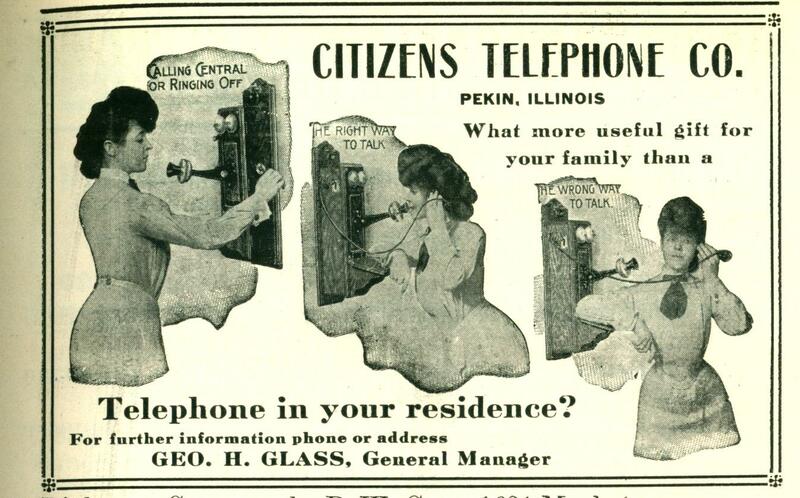 This advertisement for Citizens Telephone Co., encouraging the technological innovation of the residential telephone, was published 104 years ago, in the 1914 Pekin City Directory. Citizens Telephone continued to occupy the second floor of 405 Court St., though, and the city directories around that time usually listed “405½ Court St.” as the phone company’s address. For a while, as shown in the 1913 and 1914 directories, Citizens Telephone shared the building with Idylhour Theatre, located on the ground floor, but eventually the phone company became the lone occupant of the building. The Sesquicentennial’s account of Citizens Telephone goes on to say that, “The Citizens Company was sold to W.S. Green and associates, who had formed a new company (still called Citizens Company). They promptly traded East Peoria and Delavan service rights to Central Union (later absorbed by the Bell System) for the ‘long distance phone system’ in Pekin and brought in hundreds of thousands of dollars of new capital to replace the mass of bare wires in town with one of the most extensive underground cable systems to be found in a similar-sized community anywhere. Thanks to the old Pekin city directories, we are able to correct one important detail of this account. It was not in 1938 that Citizens Telephone was taken over by Middle States. Rather, the takeover must have happened about 10 years earlier, because the city directories list Citizens Telephone at 405 Court St. up until 1928 — the city directory of that year for the first time shows “Middle States Telephone” at that address, and so it would continue for the next 39 years.